For examples of use and more screenshots click here. Each planet orbits the Sun in its own orbital plane, and (with the exception of Pluto) these orbital planes almost coincide with the ecliptic plane. Thus it is approximately true that all the planets move in the ecliptic plane, with slight movements above and below it (somewhat larger vertical movements in the case of Pluto), so at any given time the position of a planet is approximately specified by a longitude, called the celestial longitude (a.k.a. the ecliptic longitude). Astrologers generally ignore the angle of a planet above or below the ecliptic plane, and consider only its celestial longitude. The chart displayed by this program is not the kind of horoscope chart displayed by most Western horoscope programs. A Western natal horoscope represents a picture of the sky at the time and place of your birth. The 9 o'clock position corresponds to the eastern horizon. This is the position which is 'ascending' (in the sky) at that time and so it is called the 'ascendant'. In contrast, the chart displayed by this program represents the planets on the ecliptic, as viewed from a position in space directly above the Earth. The ecliptic is divided into 360 degrees. The 3 o'clock position corresponds to zero degrees, and degrees increase anti-clockwise, so 90 degrees is at the 12 o'clock position. For example, see the chart here. 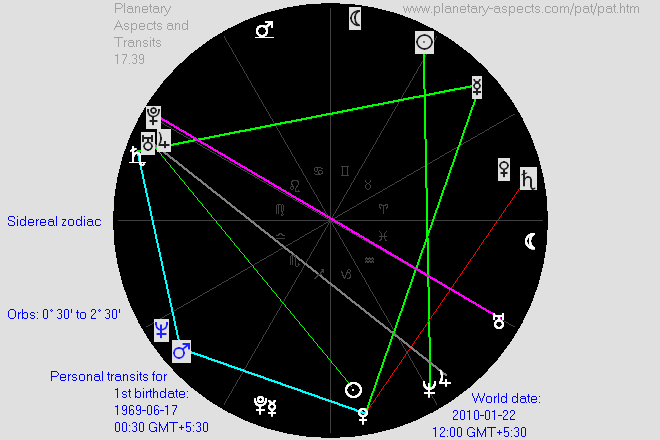 Uranus is at 32°11', which is 2°11' in Taurus (as shown in the tabular display below the graphical display). The Sun is at 106°15', which is 16°15' in Cancer. Jupiter is at 223°21', which is 13°21' in Scorpio. And Pluto is at 290°7', which is 20°7' in Capricorn. 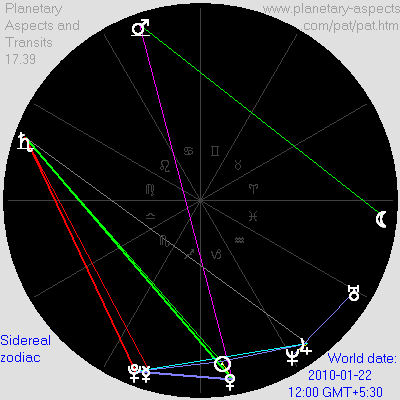 Even though the chart as displayed in this program is not the same as the chart displayed in a Western horoscope, the zodiacal positions of the planets in the two charts is the same (when calculated correctly). When the angular separation of two planets (that is, the difference in their longitudes) is close to 0°, 30°, 45°, 60°, 90°, 120°, 135°, 150° or 180° then the planets are said to form an aspect. These have names: conjunction (0°), square (90°), opposition (180°), etc. When three or more planets are such that each pair of planets forms an aspect then we have what is called an aspect pattern. For a more detailed explanation of aspects and aspect patterns see Planetary Aspect Patterns. Contemporary astrological practice (in which natal charts and transits are interpreted and used for prediction) employs astrological signs (Aries, Gemini, etc.) and houses (twelve of them, each divided into three decans), and proceeds to add complications such as planets ruling signs and houses, and planets being exalted, dignified, etc., according to which house they are in. Signs are classified as cardinal, fixed and mutable. Houses are said to correspond to work, relationships, etc. This software does not include these complications, being concerned only with aspects and transits. It has two purposes: (i) to provide practicing astrologers (and those with an interest in astrology) with accurate and easily accessible data concerning world transits, natal charts, personal transits and synastry and (ii) to provide information about planetary aspects and transits so as to check the claims of Richard Tarnas in his book Cosmos and Psyche. What is needed for the latter is only an understanding of aspects and transits and some grasp of the meaning of planetary archetypes (for which see Cosmos and Psyche). A transit occurs when an actual (that is, a moving) planet forms an aspect with a planet in the natal chart, so transits occur over a period of time. Richard Tarnas also uses the term to mean an aspect between two actual planets lasting a certain period of time. The duration of a transit may be short (perhaps just hours) or long (perhaps years), and depends on the value assigned to the orb for that aspect: the larger the orb the longer the transit. The natal chart: The positions of the planets relative to the time and place of an individual's birth are regarded as bearing a significant correspondence to the person's life as a whole, reflecting the specific archetypal dynamics and relationships expressed in his or her specific psychological tendencies and biography. World transits: The positions of the planets relative to the Earth at any given time are regarded as bearing a significant correspondence to the prevailing state of the world, reflecting the state of collective archetypal dynamics visible in the specific historical and cultural conditions and events of that time. Each of these can be calculated either using a tropical zodiac or a sidereal zodiac (see more on these below). Screenshots showing a world transit, a personal transit and a synastry may be found at Examples — Friedrich Nietzsche. The range of dates which may be entered is from January 1, 1 CE, through December 31, 2799 CE. The longitudes of Uranus, Neptune, Pluto and the Moon cannot be calculated by this software for dates prior to January 1, 1600 CE, so for such dates these planets will not appear in the table or in the graphical display. The longitudes of Pluto and the Moon cannot be calculated by this software for dates after December 31, 2099 CE. Clicking on the 'Now' button sets the world date to the current date, time and timezone, as read from your computer. When changing dates and times by means of the drop-down menus you may need to click on the 'Compute' button to get the result in tabular or graphical form. Do this especially if the 'Display chart' (which changes to 'Display table') button is not visible. You can easily switch back and forth between the tabular display and the graphical display using this button. The results are displayed in a table, and can also be displayed graphically. An example of tabular and graphical results for a world date are given in the Introduction, and examples of the other types of calculation are given here. 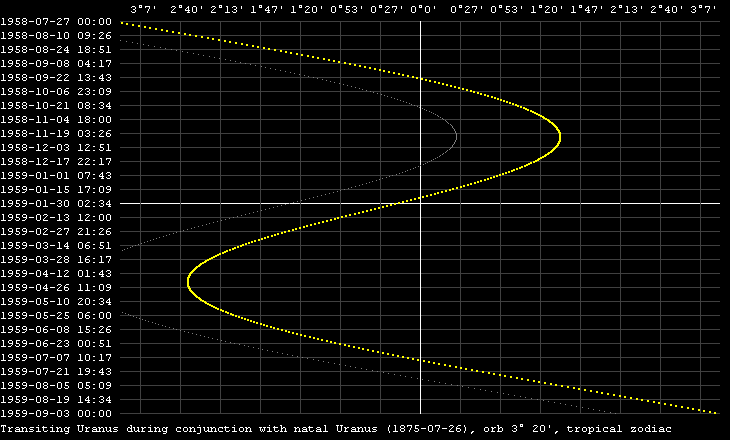 An 'r' following the longitude of a planet indicates that it is retrograde (that is, apparently moving backwards). It is fairly common for planets to be retrograde; this is due to the relative motions of the planets and the Earth. The angle values in the table give the difference in degrees and minutes from the exact value of an aspect. For example, if Mars and Venus are shown as Sqr 3° 0' that means that the difference in their longitudes is 3° away from the exact value for a square aspect, namely, 90°, so that difference is between 87° and 93°. A '+' following an angle value means that the aspect is increasing at the date and time shown, and a '-' means that it is decreasing. Aspect patterns with three or four planets have an "av." value shown. Each aspect in the aspect pattern differs from an exact aspect by a certain amount, and the "av." value is the average of these differences. For example, a Jupiter-Mercury-Moon T-square may be composed of a Jupiter-Moon opposition with exactness of 0°37', a Jupiter-Mercury square, 1°43', and a Mercury-Moon square, 2°20', with average difference-from-exact of 1°34'. By moving forward and back by a day or a half-hour one can find the date (and time) at which the average value is a minimum and thus the aspect pattern itself is most exact. 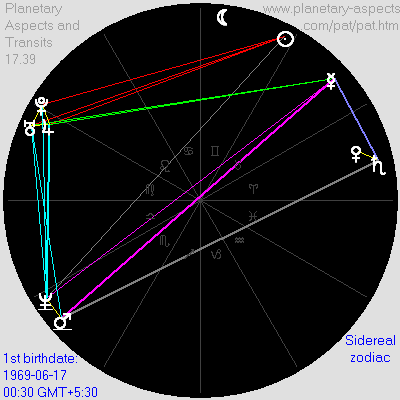 The phrase 'Both zodiacs (tropical and sidereal)' does not mean that the results shown are somehow a "blend" of the two systems (as one user thought). Rather it means that the results are the same regardless of whether the tropical zodiac or the sidereal zodiac is being used. The same kind of report is available for personal transits by clicking on the 'Report' button, as illustrated below. For personal transits, however, the results do depend on which zodiac is selected. 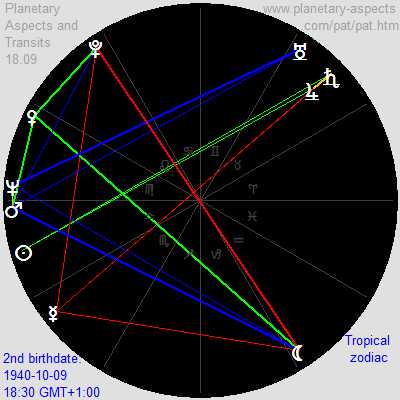 The colored graph shows the difference from exact conjunction when the tropical zodiac is used, and the gray line shows the difference when the sidereal zodiac is used. The selection of zodiac in the Configuration panel determines which graph is colored (namely, the graph for the selected zodiac) and which is gray. Right-mouse-click on a (non-black) pixel shows the corresponding date and time, as shown at right. The state of the program can be saved via the 'Save as ...' button. This is useful for saving a particular person's birth date (so the file should be named after them) and for saving a particular pair of birth dates (again with the file named appropriately). A file so saved can then be loaded again later to restore the program state. Program state files always have extension pat. The saved-state PAT files have the same format as the saved-state HPAT files, so it's possible to save a PAT state and load it into HPAT so as to compare easily the geocentric and heliocentric configurations for a single date and time. When the graphical image is displayed the 'Save image as ...' button allows you to save the image to a PNG file. You can choose between a black background (as onscreen) or a white background by means of the 'Save graphic ...' checkbox in the configuration panel (see below). A black background provides better contrast for an image displayed in a web page, so a white background is recommended only if you wish to print the image (so as to save on ink). This software makes it easy to search for aspect patterns and for a certain number of aspect patterns of one kind occurring simultaneously. Click on "Run". A window then opens which allows you to "Run until stopped or until finding a ..."
Select the aspect pattern you want to search for (e.g. a grand trine). Clicking on the 'Configure' button brings up the panel shown at right. There are two zodiacs in use by astrologers. Vedic (Indian) astrologers use a sidereal zodiac whereas most Western astrologers use a tropical zodiac. The difference between them lies in the reference direction used as the zero for specifying planetary longitudes. The Vedic system uses the direction of a constant point on the ecliptic, a point in the constellation of Aries, so it is known as zero degrees Aries. In the 2nd century CE the Greek astrologer Claudius Ptolemy took zero degrees Aries to be the direction of a line from the Earth through the Sun at the moment of the vernal equinox. Due to what is called the precession of the equinoxes this direction is now no longer the same as the direction used by Vedic astrologers. Over the centuries the difference has increased, so that now (2010) the difference between them is about 24°. Consequently the position with respect to zero degrees Aries of a planet according to the tropical zodiac differs by about 24° from its position according to the sidereal zodiac, with the result that often planets are located in different astrological signs in the two zodiacs. This has given rise to debate among Western astrologers as to which zodiac is preferable. For a more detailed discussion of these two zodiacs (and their influence on personal transits) see Tropical and Sidereal Zodiacs. This software allows you to use whichever zodiac you prefer. 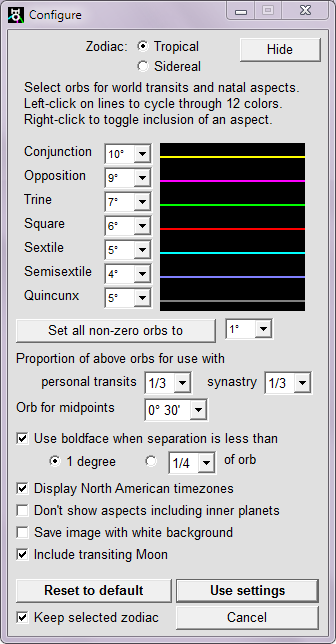 When the 'Don't show aspects including inner planets' checkbox is checked, then only aspects involving any two of Jupter, Saturn, Uranus, Neptune and Pluto are displayed in the chart. When the 'Keep selected zodiac' checkbox is checked, the current zodiac setting is not changed by the 'Reset to default' button. Or you might wish to color the aspects according to the Huber approach to astrology: Red for squares and oppositions (depicting dynamic energy), blue for sextiles and trines (depicting relaxing energy), green for semisextiles and quincunxes (depicting inquisitive energy) and orange for conjunctions (depicting the blended energy of creativity). The image at right shows the natal chart in Huber colors for John Lennon. In natal charts and synastry the natal Moon (Moon position at time of birth) has a fixed position. In charts for personal transits the natal Moon has also, but there is also a transiting Moon (Moon position at a specified time). For a chart of personal transits you can choose to include the transiting Moon or to exclude it. This choice does not affect the other types of chart. Thus the program allows you to identify the current transits and to find out when they begin, when they end, and when they become exact (by using the 'Back' and 'Forward' buttons). and (b) natal Mercury must be opposite to natal Mars, and the natal chart (at right) confirms this. Thus on this day the transiting planets Venus and Saturn form an exact kite with the natal planets Mercury and Mars (with all aspects less than 1°) — an auspicious aspect pattern, though it must be interpreted with regard to the archetypal qualities of the four planets involved. Something planned for this day (by the person whose birthdate this is) would likely be successful. For millennia some days have been considered "good" (auspicious) and some "bad". In Babylonian times (and occasionally today in some quarters) whether a day was "good" or "bad" depended solely on the number of its day in the (or in some) calendar. This software enables a more "scientific" approach to this question. So it is advisable, each day, to inspect one's personal transits (and to use the facility to move forward by 30 minutes) to see whether (at sometime during the day or evening) the transiting Sun or Moon makes a square or opposite aspect to any of your natal planets. If so, be warned, especially if the transiting Sun or Moon forms a square or opposite aspect to your natal Mercury or Venus. And the transiting Moon usually forms a square aspect to at least one of your natal planets several times each (lunar) month. Another thing to look for would be whether a transiting planet is (or becomes) square or opposite its corresponding natal planet, e.g. if transiting Venus is opposite natal Venus (as in the second case above), or if transiting Saturn is square to natal Saturn (which could indicate a vulnerability to physical accident, such as a fall). In the case of Jupiter and Saturn, the transit of transiting planet to natal planet would last several weeks, so indicates a period of danger (especially when the transit starts to approach exactness) rather than a particular day. On the other hand, the Moon is square to the natal Moon only for a period of about eight hours.